Is it Parody or Dunning Kruger by Mike Jonas at WUWT? His first article (archived here) was a lot of arithmetic around climate sensitivity and attribution, which I won't bother with. It wasn't CO2 before therefore... - in his second in the series (archived here) he resurrected the ancient denier meme about the medieval warm period (or medieval climate anomaly) and the little ice age. This calls on the logical fallacy that if CO2 wasn't the cause of warming in the past then it can't be causing warming now. Which is a non sequitur (it doesn't follow). CO2 doesn't lag temperature as much as deniers think - the third article (archived here) was the denier meme "CO2 lags temperature". Equilibrium climate sensitivity - in his fourth article (archived here), Mike sets out to demonstrate how little he knows about ECS, climate models and climate science in general. Evidence of past climates supports the fact that atmospheric CO2 is the "control knob" of climate. Turn it up and the world gets warmer. Turn it down and the world cools. Over time, CO2 was probably more often a feedback than a forcing, but not always. For example the Siberian Traps spewed massive amounts of CO2 into the air in a geologically short period of time (around 60,000 years), and caused the earth to heat up. However CO2 is not the only thing that can force climate change. When something else happens to cool (or warm) the planet, then CO2 becomes a feedback rather than a forcing, and exacerbates the forcing. For example, when there is orbital forcing that triggers an ice age, the world cools, the oceans absorb more CO2 and the world cools even more. Things settle down when as much energy is emitted from earth as comes in from the sun, the oceans stop absorbing excess CO2 and equilibrium is restored - until there's a trigger in the other direction. Earth warms, the oceans give up CO2 and the earth warms more until the balance is restored again...etc etc. There is more than one problem with Mike's second article. It's not just that his conclusion relies on a logical fallacy (Telltale Sign No. 2). In his second article, Mike all but ignores all the scientific research of the past fifty years or more - since around 1964. He posted a schematic that isn't what he says it is. An old drawing from the very first IPCC report, which was an older drawing based on much earlier schematic musings of Hubert Lamb. 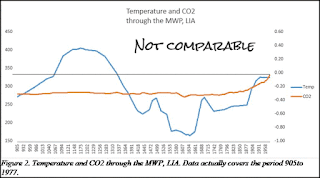 What Mike apparently set out to do was prove that the greenhouse theory is all wrong because CO2 didn't cause the earth to warm in what some call the Medieval Warm Period (MWP) or cause it to cool during the Little Ice Age (LIA). I know you'll all recognise that his conclusion doesn't follow. Just because your car didn't start this morning because the battery was flat, doesn't mean that next week, after you've put a new battery in, it will start even when the petrol tank is empty. So … why does it matter so much whether the MWP existed, and whether it was global? The problem that a global MWP poses is that it is incompatible with the climate models, which focus almost exclusively on CO2. Past global warming wouldn't necessarily be incompatible with climate models. Global warming can be triggered by orbital forcing for example. Climate models involve a lot more than atmospheric carbon dioxide. They don't "focus almost exclusively on CO2". Climate models (the ones that he's thinking of) build in all the factors that affect climate, including changes in solar radiation, volcanic eruptions, changes in CO2, changes in aerosols and more. The more complex models even build in changes in the biosphere. You can read more in the excellent article by Scott K. Johnson at Ars Technica. ...At no place in any of the Lamb publications is there any discussion of an explicit calibration against instrumental data, just Lamb’s qualitative judgement and interpretation of what he refers to as the ‘evidence’. Variants of the curves also appear in other Lamb publications (see, eg, Lamb, 1969). ...In summary, we show that the curve used by IPCC (1990) was locally representative (nominally of Central England) and not global, and was referred to at the time with the word ‘schematic’. Deniers love to resurrect this schematic as if it's for real and global. Its origins are fifty years old this year! A lot has happened in the interim. It's not global - it's local to Central England. Not only that, but there is no calibration with any instrumental record. All his chart shows, if anything, is that CO2 didn't start going up until recently. Below I've put together some more charts based on Marcott et al (2013) and the instrumental record (GISTemp), looking over a longer period of time - around 11,000 years in fact. 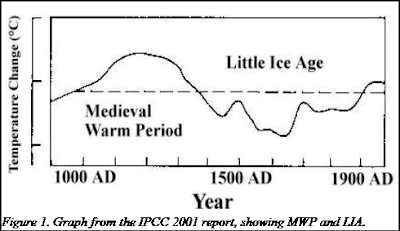 This is to put the medieval warming and the little ice age into perspective. Click to enlarge as always. The present is to the left of the chart. The variability over most of the Holocene was not down to CO2. That was fairly steady around 280 ppm up until the industrial revolution. Temperature variations were caused by other factors. For average annual Northern Hemisphere temperatures, the period 1983–2012 was very likely the warmest 30-year period of the last 800 years (high confidence) and likely the warmest 30-year period of the last 1400 years (medium confidence). This is supported by comparison of instrumental temperatures with multiple reconstructions from a variety of proxy data and statistical methods, and is consistent with AR4. Continental-scale surface temperature reconstructions show, with high confidence, multidecadal intervals during the Medieval Climate Anomaly (950 to 1250) that were in some regions as warm as in the mid-20th century and in others as warm as in the late 20th century. With high confidence, these intervals were not as synchronous across seasons and regions as the warming since the mid-20th century. 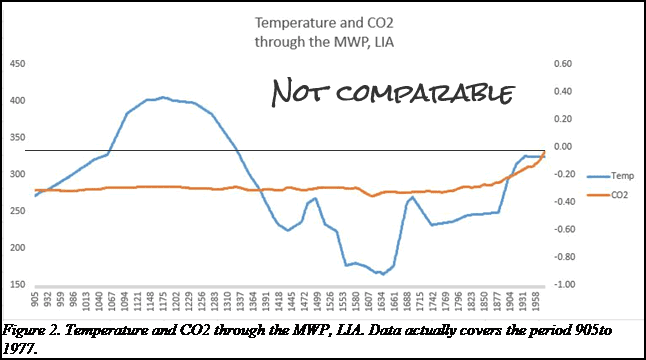 The idea that CO2 has been an important driver of global temperature is not supported by the evidence from the MWP and LIA (905 to 1977). I don't know what he's trying to say with his "905 to 1977". Does he think the medieval warm period lasted till 1977? Or perhaps he thinks the Little Ice Age lasted until 1977. He'd be wrong on both counts. As far as the Little Ice Age goes, that is thought to have been triggered by a rapid succession of volcanic eruptions. Mike's third article (archived here) was about the lag between temperature change and the change in CO2. Science deniers don't keep up with science. They find something they think supports their denial and won't let go. It doesn't matter that new research sheds new light on things. If scientific research doesn't support what they want to believe then the typical denier will either reject it or ignore it. In this case Mike ignores it. Their analysis [Perenin et al 2013] indicates that CO2 concentrations and Antarctic temperature were tightly coupled throughout the deglaciation, within a quoted uncertainty of less than 200 years (see the figure). Support for this conclusion comes from recent independent work of Pedro et al. ( 4). They used existing CO2 and temperature proxies from coastal Antarctic cores with smaller gas age–ice age differences, but somewhat noisier CO2 data and complex climate histories. They concluded that CO2 lagged temperature by less than 400 years on average over the entire deglaciation and could not exclude the possibility of a slight lead. Here's the figure that Edward Brook referred to, with CO2 plotted with temperature from both of the studies he wrote about. 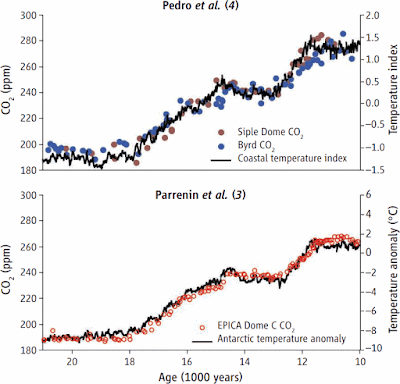 Look at how closely CO2 aligns with temperature over time. (Click to enlarge). In his fourth and last article of the series (archived here), Mike Jonas demonstrates that he knows very little about climate science in general or how equilibrium climate sensitivity (ECS) is estimated. Mike wrote that "ECS is estimated by running climate computer models". That's true. However the climate models used to estimate climate sensitivity vary from the sophisticated coupled models down to very simple models, using Bayesian or other statistical methods. And models are not the only way that ECS is estimated. It can also be estimated by looking at past climate change. Climate models’ estimations of ECS are implicitly based on the assumption that the 20th century warming was caused by CO2. Therefore any assertion that the models show that the 20th century warming was caused by CO2 is invalid (circular logic). Therefore it's circular logic to argue that based on the model, adding money to your bank account increases the amount you have in the bank. 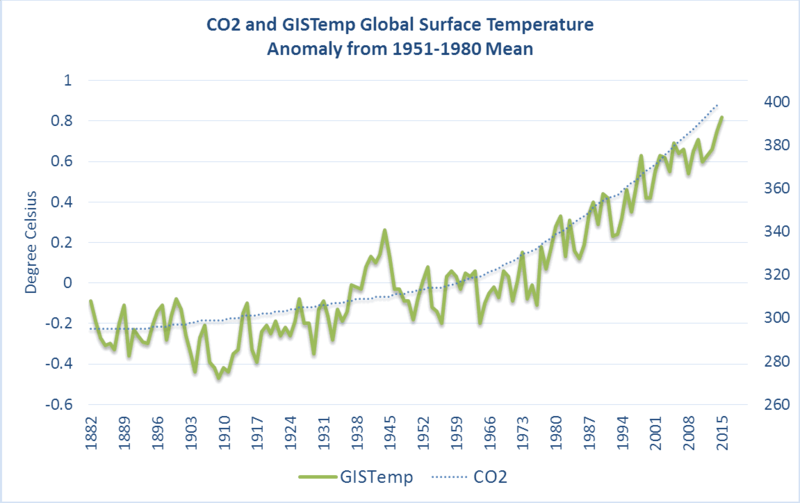 As shown above, there is an implied assumption in the models that CO2 is the principal driver of global temperature. That assumption is demonstrated very clearly in Part 1, where all of the post-industrial warming is assumed to be caused by CO2. But when the results of the models are then compared to past surface temperatures, as was done in Part 2 and Part 3, it is found that CO2 plays little part in temperature change. So, the assumption that CO2 is the principal driver of global temperature leads to the finding that it isn’t. Huh? Using the words "delicious irony" doesn't mean there is any irony, let alone delicious irony. Except perhaps that Mike's denial is itself ironic, because in claiming a logical fallacy Mike relies on his own logic fail. The problem started in his second dot point above. Mike argued that the past shows that other things can also force climate change, therefore CO2 cannot be the "principal driver". It's Mike who is illogical. Just because orbital forcing can trigger climate change doesn't mean that CO2 is not the principal driver of the current global warming. Any more than it proves that the Siberian Traps didn't cause global warming 252 million years ago. The "thoughts" below are all from the fourth and final article in the series by Mike Jonas. There was much discussion about radiation, convection, black boxes and the water cycle. The comments were, as expected, much more wrong than right. CAGW is almost, but not completely, 100% a bunch of malarkey. Thanks for the hard work and informative series, Mr. Jonas. Bill H thinks that climate scientists have missed the fact that it rains - seriously! In my opinion the biggest thing these people missed was the increase of water vapor also increases the convection cycle. Something that CO2 is powerless to stop. When you boil water, its temperature rises to 100 C, then stops rising until all of the water is gone. If you condense the steam and return it to the pot, it stays at 100 C forever, no matter how much you turn up the heat. That is the situation we have on earth. The water vapor in the atmosphere is mixed with inert gas, mostly nitrogen, so instead of “boiling” warm water humidifies the air. The warm humid air gains buoyancy and rises until the laws of nature cause it to again form liquid water and rain out. And, the surface equilibrium is that of water boiling at reduced pressure. What happens if the sun’s radiation increases? It rains more. What happens if we add more CO2 to the atmosphere? Nothing. If water vapor were a positive feedback, the system would have been driven to its maximum sustainable temperature (based on solar flux) by some excursion, caused by some random event (e.g. the Chicxulub asteroid impact) long ago. Clearly, the system must have negative feedback, and lots of it, to maintain the stability that it has maintained. I think Willis Eschenbach has remarked on the stability several times. Why does black ice exist in shaded areas on winter roads if back radiation can warm the ice? Maxwell, Clausius, Carnot, and Feynman all proved the “greenhouse effect” is due to the atmospheric mass/gravity/pressure/heat capacities gravito-thermal “GHE,” NOT radiation/Arrhenius radiative GHE, which also falsely assumes radiation dominates convection; it does not. Oh my sweet lord. The IPCC in an appeal to authority. Wow in high heels. Charlie thinks that technology will limit warming to somewhere between three and six degrees. I can imagine 60 years from now when all this hysteria will most likely be a wash and a the but of an odd joke. Technology will be coming along and we might have a co2 concentration if about 550 to 600 ppm that is leveling out in trend. “You guys remember how bad our flowers grew on 300 ppm? You could barely keep some plants alive.” they will say. Knock knock who’s there Al Gore. I wish that was now. I’ve started referring to Warmists as Water Vapour Convection ‘Deniers’! It will come back with the next La Nina. If true that traffic loss is inexplicable. As much as I would welcome this decline I doubt its authenticity. Not nearly enough squirrels, too much Eshenback and Jonas going over the same old ground. Paris will probably fire up the conspiracist element (aka most of them) what with the UN and all those foreigners like Obama being involved. I thought the real estate values of Wuttersville would improve once the neighbourhood thug (dbstealey) was run out of town, but hell, maybe the belligerent fool was its star attraction (I can't detect any other changes to style or content). Also President Obama released This video re major EPA regulatory initiatives about 6 hours ago and it was splashed in news media across the planet. Anthony has not responded. The reasons may be utterly mundane (attending Sunday mass?) but the lack of comment is unusual. The Pope and the President's moral imperative steam roller has crested the hill. Get out of the way or you'll be squashed. Probably half the audience at Wuuuterville was there to see what lengths Dave Boehm Stealey and Anthony would go to get certain people to shut the fok up. GOP money$ depend heavily on that... Big Whale, a local bundler checks up every so often. I love that stupid MWP temperature plot that deniers continue to use. 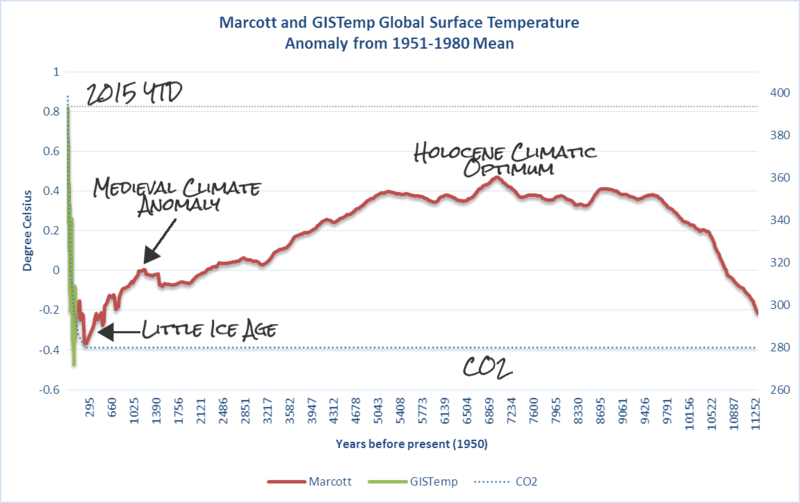 If - for the purposes of entertainment only - we pretend there is any logic to the deniers over at WUWT, then all Michael Mann should have done to create the hockeystick was roughly scribble it out by hand without bothering with all those tree rings. Then, and only then, the Wutters could have believed in it. And I have never understood how deniers convert 'the Vikings settled in Greenland' into an accurate temperature plot. Sou, Peter Sinclair at Climate Crock has a great vid of Richard Alley dispensing with the CO2 lag myth. Thanks for that Richard Alley video link. I've been looking for an updated version of his 2009 AGU lecture "The Biggest Control knob- CO2 in Earth's climate history"
And don't of course forget Shakun et al. 2012. I have wondered if global sea level also affects atmospheric CO2 concentrations. Can't think of a mechanism off the top of my head. There is the coral reef hypothesis that states that rapid flooding of tropical continental shelves increases coral reel formation, increasing CO2 in the atmosphere (approx 0.6 mole CO2 for each mole of CaCO3 precipitated). When sea level drops, there is an increase in weathering of the exposed shelf, reversing the reaction. This is thought to contribute to some of the CO2 variation over glacial cycles. Among other things, the image is not exactly FAR Fig 7.1(c), and nothing liek it was in the TAR, or even the SAR. "the image is not exactly FAR Fig 7.1(c)" : Thanks for pointing this out. I have posted a correction on the WUWT page, with credit to yourself. wrt it not being in the TAR or SAR - that was what intrigued me about it : why did it disappear? A fair question, I think, but I don't claim to have the definitive answer. In any case, as I say in comments below, the truly important issues that desperately need to be brought into the open and discussed properly are those of the water cycle and of clouds. It matters because anyone who claimed this image to be from FAR, SAR or in this case, the TAR(!) hadn't gotten this this from the FAR, so hadn't read the serious caveats surrounding it it *on the same page* (or had ignored them). My post above included annotated FAR pages. In academe, such is called "false citation" a form of falsification (or fabrication, depending on local usage), i.e.,such things can be elements of academic misconduct complaints. At the very least, they are instant credibility-wreckers. Lamb's graph was noble work in 1965, but has long been a "flat-Earth map". The FAR was put together in a hurry, there really wasn't much in the way of real reconstructions, they caveated it heavily, and then got on with doing the research and starting real reconstructions. Why would they keep something clearly obsolete? One could insist that smoking is perfectly safe because science hadn't proved otherwise a century ago. Since makes progress, and paleoclimate made a great deal since 1990. HW kicks off with "His first article (archived here) was a lot of arithmetic around climate sensitivity and attribution, which I won't bother with.". Unfortunately, not bothering with it means that the whole thrust of the articles was missed. What I was doing in the articles was to assume that the climate models were correct, and to establish the formulae that best represented the mid-range models (specifically, ECS=3.2). The subsequent articles then applied those formulae. Re the 2nd article, HW highlights my Figure 2, saying there is no justification for the mismatched scales on the two vertical axes". The vertical axes are scaled automatically by MS Excel, and the two axes are different because one is temperature in deg C and the other is CO2 in ppm. Using the climate models' formulae, the warming effect of the CO2 is presented alongside temperature and in the same units on a single vertical axis in figure 3. In the article, I do address the dispute over whether the MWP and LIA were global, and I provide links to peer-reviewed papers that indicate that the MWP occurred in many parts of the world. But I don't hammer the point, accepting that there is dispute - but that is why I went on to Part 3. Of part 3, HW says Part 3 "was about the lag between temperature change and the change in CO2". Well no, that isn't what it was about at all. In fact, the article states "Even getting rid of the 800-year time lag of CO2 behind temperature would make no noticeable difference to Figure 2.". Figure 2 in this article showed the full CO2 impact on the 400,000-year temperature record of the Vostok ice core data, assuming that the mid-range models' ECS of 3.2 is correct. The impact was clearly minor - 1/6 at best. Just look at figure 2 : in terms of CO2's effect on temperature, the lag is irrelevant - it makes virtually no difference whether it is there or not. It is also very easy to eyeball the graph and confirm that it does indeed represent an ECS of about 3.2. Re Part 4, HW says "Climate models are based on physics" and that models "are not used to show that that CO2 causes warming, that's already known". I do accept that even though I presented it as simply as I could, this article may well have been the most difficult to understand. In the article, I highlight some very significant places in the IPCC report where they explain how the models quantify climate responses to forcings, and I show how the models themselves treat the CO2-caused warming as (as HW puts it) already known. In other words, it is implicitly used as a premise. That's not a particularly easy argument to follow, so I'll limit myself here to addressing HW's other point - that the models are based on physics. As quoted in my Part 4, the IPCC report itself says "parametrizations are still used to represent unresolved physical processes such as the formation of clouds and precipitation [..] Uncertainty in parametrizations is the primary reason why climate projections differ between different [climate models].". So specifically with respect to the formation of clouds and precipitation - the two specific areas where I was challenging the models' findings - the models are NOT based on physics, because the physics is not known. Mr. Jonas, Your citation of the IPCC 1990 report is a false one. It is similar to the graphic (schematic) on page 202 in Chapter 7 of the 1990 report, but is *not* the schematic used. This alone calls into question your credibility. In academia this would be possible misconduct. It consists of both misrepresentation and the inference that you never actually read the source material. b) being deliberately deceptive, as per “How to Lie With Charts”, one of the easier ways." The end date for the Lamb schematic is 1950. The data was compiled from mainly UK records. The dotted line represents temperature at the beginning of the 20th century (1900). The schematic shows MWP temperatures approximately 0.5 C warmer than the temperature in 1900. Question, can you not append the last 65 years of data to the schematic? Why haven't you done so? 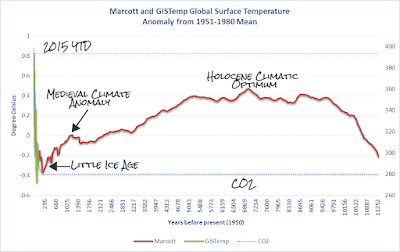 If you did, wouldn't it show that present temperatures are 0.2 to 0.3 warmer than the MWP? Isn't this also completely consistent with current reconstructions? The whole IPCC 1990 Report/MWP shenanigans is what Paul Krugman would call a 'zombie lie' -- no matter how many times you try to kill it with the actual facts it just keeps rising up again. Perhaps you - like Monckton - will threaten me with libel for pointing out your little lie/misrepresentation. Hi Kevin - You are correct. The graphic that I posted was indeed the wrong version. I hadn't noticed until last night (Australian time) when I first saw JohnMashey's comment (August 3, 2015 at 3:54 PM). I have now checked, and he was correct that "the image is not exactly FAR Fig 7.1(c)", but it is worth noting that the two graphs are identical in terms of the data that they represent. The only differences are in the texts. So the use of the wrong graphic made absolutely no difference to any of the calculations that I presented. So, how did I make the mistake? The problem for me with the IPCC FAR Fig 7.1(c) was that while it was the figure that I wanted to work with (for reasons given in my article), it had no vertical scale. Were the tick marks at 1 deg C, or 0.5 deg C, or something else? I had to hunt for a version that had the vertical scale. When I had found the scale, and done enough checking to be sure that it tuly matched IPCC FAR, I unfortunately then placed the wrong version in the document - and I really don't know where that version came from. All very unfortunate, but my article did provide a link direct to the IPCC FAR source, so it is easily checkable that the version posted differed in no material respect from the IPCC original. The underlying data was exactly the same. In my article, I used all of the period covered by the graph. You say "The end date for the Lamb schematic is 1950", but if you check the IPCC FAR diagram you will see that it ends a little later than 1950. My reading puts it at about 1977. You ask "Question, can you not append the last 65 years of data to the schematic? Why haven't you done so? ". The answer is twofold. (1) To add in more data from somewhere else would be bad practice because the resolution and origin of this data and of some other source would make their co-use highly problematic. (2) I particularly wanted to work with the IPCC FAR data, as I had stated. And it is easily checkable that I did work with an exact match to the IPCC FAR data even though I posted the wrong figure in the article. So, far from suing you, I am very happy to apologise for making that mistake, and to thank JohnMashey and yourself for pointing it out. Fortunately, it made zero difference to the substance of my articles. Those articles do highlight some very serious shortcomings in the climate models, and I would urge you to move on and have a look at those issues too. Of course, if you find that I have erred in matters of substance, then I will be happy to be corrected again. Well, maybe "happy" isn't the best word, but if I'm wrong about something then I want to know it. Hi Kevin - I posted a reply, and it was published on "August 9, 2015 at 6:38AM" (I have kept the screen dumps), but it has since disappeared. Hopefully someone at HW can find it and restore it. Otherwise, if it's not back up in a while, I can post it again. The thrust of the reply is that yes I had put up the wrong image, but that it was easy to check that it was identical in terms of the underlying data, so made no difference. I also addressed your question about adding in the last 65 years. But the issue of most concern is still the very serious shortcomings in the climate models. Anyway, I've fished them out of the spam bucket. I'll get rid of any duplicate comments shortly. Thanks, Sou. I suspected it might be something like that, but couldn't see anything obvious that could be upsetting a filter. But now I know it's Google, well that explains it! Sou- check the spam comment list; I believe I have at least one comment stuck in there. Thx. No. Nothing there from you, Kevin. HW's final criticism, that "Mike can't make up his mind about what he knows. He accepts that CO2 causes warming, but then claims it doesn't" misunderstands my statement, which is that IF you assume that CO2 is the dominant driver of climate, THEN that leads logically (as shown in the articles) to the finding that it isn't. Now that was an outcome that I couldn't resist putting in as the final footnote, but in truth the really important issues, and the ones that really do need to be addressed by the climate science fraternity, are those of the water cycle and of clouds. Wrong Mike - logical fallacies abound as described in my article. That's telltale technique No. 2, of climate science denial. PS There are also women who research climate science. I cannot imagine that any of the men or women will take the slightest bit of notice of what you think needs "to be addressed". They will continue with what they, in their informed view (unhindered by uninformed denial), consider as research priorities. I said "the really important issues, and the ones that really do need to be addressed by the climate science fraternity, are those of the water cycle and of clouds.". The IPCC report AR4 Box TS.8 says "parametrizations are still used to represent unresolved physical processes such as the formation of clouds and precipitation.". Seems like the IPCC and I are on the same wavelength. Mr Jonas, on the one hand you say, "(1) To add in more data from somewhere else would be bad practice because the resolution and origin of this data and of some other source would make their co-use highly problematic." and on the other you say, "The problem for me with the IPCC FAR Fig 7.1(c) was that while it was the figure that I wanted to work with (for reasons given in my article), it had no vertical scale. Were the tick marks at 1 deg C, or 0.5 deg C, or something else? I had to hunt for a version that had the vertical scale." Do you see any inconsistency here? It's not OK to append new data, but it's entirely OK to invent a scale where none existed! Where did your figure come from? How do we know they used the original intended scaling? More important - what does the data represent? This schematic has been the subject of innumerable blog posts. Anyone that spends 5 minutes looking into it knows that it traces it's roots back to Lamb (1965) and that the data behind it (from 1639 forwards) is the Central England Temperature record. From that alone we know that it is not a *global* reconstruction. No one with any credibility would try to pass this off *today* as a global temperature reconstruction. No, the only reason this is trotted out is because it fits an agenda. Normally skeptics are all about uncertainties - where are they here? Normally skeptics are all about the data - where is the data behind this schematic? All of that gets swept under the carpet because they like the 'big bump' labeled "MWP"
But let's just say for a moment that there is something intrinsically useful about this schematic. Well, it has been researched. The scaling has been verified as best we can. The smoothing functions have been verified. This has all been written up in the peer-reviewed literature - see High-resolution palaeoclimatology of the last millennium: a review of current status and future prospects, Jones et al, 2009, The Holocene, pp34, Figure 7. It doesn't matter if the Lamb schematic is accurate, doesn't matter if it's regional and not global, it doesn't matter there's no vertical scale, it doesn't matter where the data prior to the CET record came from, it doesn't matter if it's in essence 50 years old. No, it fits your preconceived agenda. That's all that matters. Did I get the scale right? Yes, otherwise someone here would have pointed it out with glee. And what is ever wrong with seeking corroborating evidence. Is there evidence that the MWP was global? Yes, and I provided links. And note that there is no dispute about the LIA, which of its own is sufficient to support my argument. Do the climate models model the past well? No, they don't. They can't model the Milankovitch cycles, they can't reproduce the MWP (which is why some wanted to get rid of the MWP, and which triggered my interest), and they can't reproduce the LIA, in spite of having masses of free variables that can be tweaked in all sorts of directions, and having dozens of different models to try it with, and having tried desperately to get there over the last several decades. In the present, the tropical troposphere has not (warmed as predicted). [Parentheses to prevent ambiguity]. That's extremely important, as the tropical troposphere is the source of most of the models' global warming. The models consistently overestimate the rate of warming. There's too much that just isn't right. That doesn't mean that everything's wrong, of course, but it does mean that It's time to stop using fringe issues to block your mind to the major issues. Cut to the chase: correct me on the water cycle and clouds. A lot rides on them, so if I'm wrong on those, then it follows that I'm wrong on a lot more. Excuse my confusion but do climate models need to model the milankovitch cycles ("They can't model the Milankovitch cycles"). Surely the Milankovitch cycles already model themselves, so to speak. Besides, these cycles operate over timescales beyond what is needed to respond to the current change in global temperatures. Starting with the ice ages that have come and gone in regular cycles for the past nearly three million years, there is strong evidence that these are linked to regular variations in the Earth’s orbit around the Sun, the so-called Milankovitch cycles (Figure 1). These cycles change the amount of solar radiation received at each latitude in each season (but hardly affect the global annual mean), and they can be calculated with astronomical precision. There is still some discussion about how exactly this starts and ends ice ages, but many studies suggest that the amount of summer sunshine on northern continents is crucial: if it drops below a critical value, snow from the past winter does not melt away in summer and an ice sheet starts to grow as more and more snow accumulates. Climate model simulations confirm that an Ice Age can indeed be started in this way, while simple conceptual models have been used to successfully ‘hindcast’ the onset of past glaciations based on the orbital changes. The next large reduction in northern summer insolation, similar to those that started past Ice Ages, is due to begin in 30,000 years. "Is there evidence that the MWP was global? Yes, and I provided links." "There were no globally synchronous multi-decadal warm or cold intervals that define a worldwide Medieval Warm Period"
Mike writes "They can't model the Milankovitch cycles, they can't reproduce the MWP "
"To better understand the origin of this warm period, we use model simulations constrained by data assimilation establishing the spatial pattern of temperature changes that is most consistent with forcing estimates, model physics and the empirical information contained in paleoclimate proxy records." Mike writes "which is why some wanted to get rid of the MWP"
Mike, your misconceptions have been shown to be false BY YOUR OWN LINKS!!!!!!! Don't you even bother to read them? "they can't reproduce the MWP "
Huh? Why would "they" reproduce something that ''they" say does not exist in the form you claim it does? And who are the "they" who "got rid of the MWP"? It all sounds terribly like a conspiracy. "They can't model the Milankovitch cycles"
Yes they can. A simple literature search returns several papers in which this is done, at least one of those being more than 20 years ago (I didn't do an in-depth search, it was just 15 seconds). It may even be one of the simplest thing to do with a GCM: just change the altered distribution of sunlight over the globe as a function of the Milankovitch cycles. For someone who knows so little, you sure present your claims with a lot of confidence! Now, where have we heared that again? That was the statement that made me groan as well Marco. You see this quite a lot in denier circles - implying the scientists are incompetent. My first reaction was, do they not include the Milkanovich cycle? My second was, does it matter? My third was, it would be so easy to include them. So either they do or they have made a judgement it is not necessary. And of course, whatever, there clearly are some models out there that model the cycle, even if they are not in the major models. The fastest cycle is about 21000 years. SO, back of an envelope. If climate models are for the next 100 years then they "could" be missing about 0.5% of the Milkanovich effect. Now I have little idea what this means in practical results but my guess is that it is not very large. And I cannot imagine a universe where the scientists would not have spent 5 minutes thinking about it. (Oh - wait! There is the WUWT universe!). Jammy, I don't think there are GCMs that have incorporated the Milankovitch cycles as a standard. It can, and has, been done, however. Often somewhat idealized (it takes a looooooooooooong time to do GCM runs). It only really matters if you happen to get into one of the larger variations in insolation due to the interaction between the various cycles, and even then, on a 100-year scale it won't do much, especially when you are already in an interglacial. - There is insufficient evidence to claim that the tropical troposphere has not warmed as predicted. This was all hammered out in painful detail here. TL/DR = the contrarians were shown to be making exaggerated and unsupported claims. - The models do not 'consistently overestimate' the rate of warming. Such recent model / observational divergence as there has been appears to be attributable to apples-to-oranges comparisons, weaknesses in the instrumental record and natural variability in the rate of heat uptake by the equatorial Pacific. There is nothing to indicate systematic problems with the models, or that sensitivity has been over-estimated. Hand-waving about the hydrological cycle and cloud formation isn't magically going to overturn the current scientific understanding of AGW. "There is insufficient evidence to claim that the tropical troposphere has not warmed as predicted." Carl Mears : "it is difficult to prove or disprove the presence of the tropospheric hotspot given the current state of the data"; "it is obvious that the observed trends in both temperature datasets are at the extreme low end of the model predictions. This problem has grown over time as the length of the measured data grows. "; "The two distributions (RSS+Hadcrut4; CMIP-5 models) overlap, indicating consistency of this set of observations with the models, though the mean value shown by the observations is clearly lower than that predicted by the models. "; "Conclusion: Taken as a whole, the errors in the measured tropospheric data are too great to either prove or disprove the existence of the tropospheric hotspot. Some datasets are consistent (or even in good agreement) with the predicted values for the hotspot, while others are not. Some datasets even show the upper troposphere warming less rapidly than the surface.". "1. The observations are probably not good enough to prove or disprove the presence of the hot spot. This is in part due to the added noise that one gets when calculating the ratio of two small, relatively similar, uncertain numbers. 2. Models are showing much more tropical tropospheric warming than observations. 3. I don’t think errors in the datasets are large enough to account for this discrepancy. " Steven Sherwood : [after questioning whether it matters] "Currently none of the explanations I can see for the “missing hot spot” would change our estimate of future warming from human activities, except one: that the overall warming of the tropics is simply slower than expected. It does seem that global-mean surface warming is starting to fall behind predictions, and this is particularly so in the tropical oceans (though not, curiously, on land). ". He then discusses possible reasons, revealingly omitting any kind of model error as a possible reason. John Chrisy : [After a lot of detailed quantification and explanation] "What I can say from the standpoint of applying the scientific method to a robust response-feature of models, is that the average model result is inconsistent with the observed rate of change of tropical tropospheric temperature - inconsistent both in absolute magnitude and in vertical structure (Douglass and Christy 2013.) This indicates our ignorance of the climate system is still enormous and, as suggested by Stevens and Bony, this performance by the models indicates we need to go back to the basics.". So the three experts say respectively that : models are showing much more tropical tropospheric warming than observations, global-mean surface warming is starting to fall behind predictions, and the average model result is inconsistent with the observed rate of change of tropical tropospheric temperature. Not exactly a very encouraging result for those who desperately want the models to be correct. (And I have been kind with my quote from John Christy, leaving out the damning details and just giving the summary). Nuts. Warming of the tropical troposphere is no more global warmingn than warming anywhere else. And it's a sign of *any* warming, not just greenhouse warming. Also, climate models are a lot more correct than your mates at WUWT, who are still waiting for a sign that their predicted ice age cometh. Just because you write umpteen paragraphs (which I can't be bothered reading but that look to be the "hotspot" meme) doesn't make you any more "right" than climate scientists. Your Dunning-Kruger is showing. Give it a rest Mike. Your denialist rants won't get any traction here. And quoting a denier like John Christy as some sort of expert loses you a heap more points. To fart around with "there isn't enough evidence" is so pathetically weak that even you should be able to see it. "Conclusion: Taken as a whole, the errors in the measured tropospheric data are too great to either prove or disprove the existence of the tropospheric hotspot. They mean what they say. They mean what I said. They mean you are huffing and puffing and you do not have the evidence necessary to support your claims. So stop bullshitting please. Nobody pays attention to Christy any more, not least because he is a serial misrepresenter. Since MJ is engaged in the tired old denialist argument that "the models are wrong" and this somehow matters then I suppose I'd better add that the models are not the primary source of knowledge about climate change. That would be palaeoclimate behaviour. That said, there is no evidence that the models are wrong enough to have any impact on policy, which is, of course, what this is all about at root. What a joke. The tropical troposphere virtually IS the global warming. It is where virtually all of the models' global warming originates. Let's stop the the blatant misrepresentations, Mike. BBD - Carl Mears statement is very interesting. He says the hotspot has to be there regardless. Funny that no-one can find it. Now read what John Christy said too - he found that there was a significant discrepancy between models and observation. Putting the whole lot together, it is just possible that the hotspot is as it were hiding in the error bars, but overall it is getting more difficult to support the models. Sou - Interesting that you can't be bothered reading. Seems to me you are guilty of that which you accuse me - "reject or ignore all evidence that contradicts your wacky claims" (your words not mine). I find it interesting too that while I covered - fairly - all the Climate Dialogue experts, your readers dismiss out of hand the one they don't like, even though he is one of the foremost scientists in the field. There's a lot of arbitrary rejection of evidence going on, and I'm not the one doing it. 1. The water cycle. The models understate the water cycle by quite a large margin, thus badly overestimating the warming because an increased water cycle cools. The basic science - Clausius-Clapeyron - is quite well-established and well-known. The modellers have no grounds for using too low a value for the water cycle. 2. Clouds. The effect of clouds may be quite marginal, because they have both warming and cooling effects which vary between cloud types (my article linked to an excellent NASA description). The overall effect is thought to be slight cooling. The modellers therefore have no grounds for their very high cloud feedback, especially as very little is known about the formation of clouds (as explained in detail in the IPCC report). What missing tropical tropospheric hotspot? Funny that no-one can find it. That is very clear. You are simply repeating a false claim despite correction. There is a word for that. Now read what John Christy said too - he found that there was a significant discrepancy between models and observation. Only by carrying out a methodologically flawed analysis. Why don't *you* go back and read the whole discussion - and comments - properly this time? 1. The water cycle. The models understate the water cycle by quite a large margin, thus badly overestimating the warming because an increased water cycle cools. Except the models *don't* 'badly overestimate' the warming at all. That's just a contrarian talking point derived from the not-pause. Just wrong. You are essentially clueless, aren't you? Since this is already becoming tedious, let's focus on the central (though carefully unstated) claim by MJ, which is that there is a neglected negative feedback from the hydrological cycle and therefore climate sensitivity has been significantly over-estimated. It is easy to demonstrate that this claim is false. If the climate system were dominated by negative feedbacks (the definition of an insensitive system) it would be unresponsive to changes in forcing. This would greatly reduce variability on all time-scales. However, substantial variability is visible on all time-scales, providing strong empirical evidence that the climate system is dominated by positive feedbacks and at least moderately sensitive to radiative perturbation. If this were not the case, then events like deglaciation under Milankovitch (orbital) forcing would be physically impossible as TSI is not increased by orbital dynamics, only seasonally and spatially reorganised. To get from a glacial to an interglacial climate with no change in TSI requires strong amplifying positive feedbacks. Perhaps you could give this some careful thought, MJ. Yeah, Mike complains that I didn't bother reading his comment right after he proves that he didn't read my earlier one. God knows what he means by "understating the water cycle". I'd say he doesn't understands whatever it is he thinks he found at WUWT. If the water cycle is understated, that would mean that there would be more rain and snow and flash floods than the model projections. And if "an increased water cycle cools" as he claims - if he thinks more water vapour in the air leads to cooling - that would make Mike a greenhouse effect denier. I wonder what "very high feedback" from clouds is he rabbiting on about? It looks as if he is arguing that modeled cloud feedback is too negative. Which would mean that the models understate, not overstate any future warming. Interesting that they got the past warming so close to observations. How does Mike explain that? The article was just to show how deniers resurrect tired denier memes to produce a mish mash. How they prefer 50 year old drawings to recent observations. How they don't understand what they write. Mike hasn't admitted his numerous errors here yet. The biggest one of all being that he thinks that science proves that Mike Jonas knows better than the scientists, whose work he misrepresents and misunderstands - but without that science done by scientists, mike Jonas wouldn't have any argument at all. Not even his flawed arguments. Deniers are truly weird. And if "an increased water cycle cools" as he claims - if he thinks more water vapour in the air leads to cooling - that would make Mike a greenhouse effect denier. Sounds like one of the 'convection trumps radiation' nutters like 'hockeyschtick' who can't even spell 'shtick'. If my dog walked into the house covered with as much logical fallacy as you've heaped in your post, I'd have to take her outside and give her a thorough hosing down. OK, please tell me what the logical fallacy or fallacies are. I can't reply if I don't know what you are referring to. Read the article. The most blatant logical fallacy is that if orbital or other forcing triggered global warming in the past then greenhouse gases can't cause it now. Your series was a mixture of falsehoods and logical fallacies and ignoring research that's inconvenient to your denial. A blast from the past as far as science denial goes. Not original. A mish mash of busted denier memes. It looks as if you went through the list of the most common denier arguments at SkepticalScience.com and picked out "arguments" at random. The only thing you got right is that WUWT deniers don't care what's written at WUWT, or how stupid it is, as long as it rejects science and lets them continue to parrot their support for the climate hoax conspiracy. It would be nice to take part in a conversation in which everything was treated on its merits. Instead, in today's blogosphere, misrepresentation, obfuscation and diversion are the norm. I totally agree that "if orbital or other forcing triggered global warming in the past then greenhouse gases can't cause it now" is an example of a logical fallacy. But I didn't say it. It's a misrepresentation. Just as the portrayal by HW of my "part 3" as being about the time lag was a misrepresentation. Look, I don't expect everyone here suddenly to see the light. But I do appreciate being given right of reply, not all blogs would do that (SkepticalScience, for example). That makes your diatribe against WUWT somewhat perplexing - "WUWT deniers don't care what's written at WUWT, or how stupid it is, as long as it rejects science". WUWT welcomes all opinions. No post or comment gets a free ride, and all scientific points get hotly debated. Hopefully, some of the things I have said will give some people here pause for thought. Preferably, of course, on the major issues. So, here's a simple statement : I'm always happy to be proved wrong. The two major issues in my articles were the water cycle and clouds. If I am wrong on either of those, just show me where. Point is, Mike, that you reject or ignore all evidence that contradicts your wacky claims. It's called denial. It's called cherry picking. Deniers often screech fraud, except when it they actually come across it at WUWT (or perpetrate it themselves). You don't understand the significance of past climates or the significance of the current greenhouse warming. Plus your logical fallacies were showing. Models have simulated abrupt cooling like the Little Ice Age - however the latest thinking is that it was precipitated by volcanic forcing, not just internal variability. I see you are also rejecting inconvenient research in which observations are more closely aligned with models after actual forcings replace those estimated after 2005. More cherry picking. It's probably because you don't understand climate models combined with your predisposition for science denial. If you want a weather forecast you' won't get it from climate models. They are about the trend, not short term variability. The models show that the world will warm as greenhouse gases are added, and it is. Statistics show that there is no "pause", there was a temporary slowdown in recent years, as there has been before and will be again no doubt. Just as there are also periods of more rapid warming. But as long as we keep adding greenhouse gases there will be consequences - of which global warming is one big one. Future generations will look back on flawed desperate arguments like yours and most probably view them as either criminally negligent or deluded. You've also rejected the papers that demonstrate that the tropical troposphere has warmed, as it does whenever it warms (not just from greenhouse gases). And you're wrong about how "extremely important" that is. As for fringe issues - you are the one who keeps hammering old denier memes to claim "scientists don't know nuffin'" or are you claiming that climate science is a hoax? Is it the Dunning-Kruger effect or are you knowingly trying to deceive WUWT readers? And if you are commenting here hoping to persuade us that you're not just a two-bit denier, you're wasting your time. The evidence is in. You'd be better off putting your energy into figuring out the best way to turn things around. Or counting grains of sand on a beach if the problems facing the world are too much for you to cope with. Really? Go tell that to the people who have been blocked at WUWT. Not to mention the attacks on posters from WUWT moderators. WUWT is an anti-science conspiracy blog that censors posts from people who do not suit it's agenda. Mike Jonas said: "WUWT welcomes all opinions. No post or comment gets a free ride, and all scientific points get hotly debated. " Really. I've never seen that. Try this experiment. Comment at WUWT either of these opinions. (A) Michael Mann is a brilliant scientist, or (B) Michael Mann is an idiotic, fraudulent scientist. Which one would get the easier ride? Harry is right. WUWT is antiscience and anti-reason. If Mike Jonas believes that WUWT is open to all opinions, then how come he doesn't argue on WUWT against the anti science there that conflicts with the science that he claims to accept when he is here at HotWhopper? Sou (August 10, 2015 at 12:51 PM) re your "papers that demonstrate that the tropical troposphere has warmed" which included work by Steve Sherwood in 2005. Please see my comment (August 11, 2015 at 2:54 PM) which includes material from Steve Sherwood in 2014. Millicent (August 10, 2015 at 9:24 PM). I often do. PS. There's even a reference by Steven Sherwood to the water cycle in the Climate Dialogue referred to : he says that models "appear to underpredict observed trends in the hydrological cycle". Just like I have been saying. Sou, you keep telling me I don't understand things. I note that no-one here has yet taken me up on the water cycle and clouds. Those are the really important areas, which climate science still does not understand, which are still fudged in the models, and which contribute unjustifiable amounts to the CO2-driven warming inside the models but not in the real climate. One thing I reckon I do understand very well is their importance. So if you want to do something truly useful, knock me down on those. Two things characterise climate change denialists: cognitive scotoma and a lack of empathy/compassion/social responsibility. These are almost impossible to cure. Mike - I don't know what point you are trying to make. Perhaps it's another logical fallacy: "not everything is understood to the nth degree therefore scientists don't know nuffin'"
Or maybe you are just wanting to distract people's attention away from your numerous logic fails and science fails. Or maybe you just like seeing your name in print on a science blog, instead of a conspiracy blog, so you post endless comments. You are wrong when you say that scientists don't understand the water cycle. How do you think that weather bureaux manage to forecast weather if they don't understand it? They do, and have for decades. They also know a lot about clouds, a lot more than you seem to think. Yes, clouds are an active area of research, particularly micro-physics (which is a very difficult aspect). However scientists already known a helluva lot more about clouds than you or anyone at WUWT understand about climate in general. "One thing I reckon I do understand very well is their importance. So if you want to do something truly useful, knock me down on those." Nah, the water cycle and clouds are not important. See, I have knocked you down on those. (In the style of denier argument). So if you want to do something truly useful, knock me down on those. Soou, you say "You are wrong when you say that scientists don't understand the water cycle. How do you think that weather bureaux manage to forecast weather if they don't understand it? They do, and have for decades. They also know a lot about clouds, a lot more than you seem to think." Sure, they know a lot about things in weather terms, and they can forecast quite well up to a few days ahead. But climate is something else again. As for clouds, no they really don't know much at all, as the IPCC report repeatedly makes very clear. IPCC report : "parametrizations are still used to represent unresolved physical processes such as the formation of clouds and precipitation [..] Uncertainty in parametrizations is the primary reason why climate projections differ between different [climate models].". "unresolved physical processes" means the physics is not known, they have to guess ("parametrize"). Not good. Mike, why didn't you just say I was right up above. You think that just because "not everything is understood to the nth degree, scientists don't know nuffin". That's an error on your part. Secondly, you can claim that scientists don't understand the water cycle (and you do understand it? ), but unless you provide evidence that they don't understand it, I don't believe you. Third: parameterisations are used for reasons other than lack of knowledge. They are used for processes that occur on scales too fine for GCMs. Fourth: Isn't it time you read AR5? Then again, you prefer long-forgotten fifty-year old rough schematics based on central England, to observations and recent global temperature reconstructions, so I suppose that referring to the AR4 report, which was superceded two years ago, could be considered a breakthrough. The simulation of clouds in modern climate models involves several parameterizations that must work in unison. These include parameterization of turbulence, cumulus convection, microphysical processes, radiative transfer, and the resulting cloud amount (including the vertical overlap between different grid levels), as well as subgrid-scale transport of aerosol and chemical species. The system of parameterizations must balance simplicity, realism, computational stability and efficiency. Many cloud processes are unrealistic in current GCMs, and as such their cloud response to climate change remains uncertain. Cloud processes and/or turbulence parameterization are important not only for the GCMs used in climate projections but also for specialized chemical-aerosol-climate models (see review by Zhang, 2008), for regional climate models, and indeed for the cloud process models described in Section 7.2.2 which must still parameterise small-scale and microphysical effects. The nature of the parameterization problem however shifts as model scale decreases. The following section will briefly assess recent developments relevant to GCMs. Fifth: for you to get some understanding of what is known about cloud microphysics, look at the AGU14 lecture from Ulrike Lohmann, (see the link I provided above). Finally - what is your point? I can't tell what point you are trying to make with your water cycles and clouds. In the article above I was commenting on your Dunning Kruger-itis, the fact you ignored scientific research and were woefully wrong about numerous things, like CO2 being closely coupled with change in surface temperature, medieval climate, etc etc, the fact that you don't understand much at all about climate science (but make out that you know more than scientists). What's obvious is that you know less about climate science than most HW readers who aren't climate scientists, and way less than the HW readers who are climate scientists. Climate scientists know an awful lot about climate. They know so much about climate that they are able to build very complicated, sophisticated models that are very useful in projecting what the climate will be like over coming decades, under different scenarios. It seems to be a technique of climate deniers to find a complex area of the climate and then say "Look, climate science is rubbish because - water vapour". Do they really think scientists do not think about which areas need more research and understanding? So, Mike Jonas. What do you think you add to the understanding of climate science by standing on the sidelines and making hand wavy gestures about clouds, water vapour and the water cycle? You asked to be knocked down on these earlier but you have said nothing of any substance on these. The only thing you have said is you, (and apparently only you), know how important these are. We all await agog for further enlightenment. (No we don't). Finally - what is your point? I can't tell what point you are trying to make with your water cycles and clouds. He's insinuating that there is a negative feedback (clouds maybe? convective cooling? who cares?) which means low sensitivity and CO2-as-usual. And he's obviously wrong. Something I couldn't help noticing Mike has so far failed to acknowledge. Well, that would be inconsistent, wouldn't it, BBD. Because in his second article Mike was arguing that there was global warming in medieval times, of some significance. There wasn't - there was a bit of a blip, and there were some regions that warmed quite a bit but it wasn't globally synchronous. However if there had been significant warming globally it would have pointed to quite high climate sensitivity, not low sensitivity. Does he want it both ways? Or is this yet another example of Mike not understanding much about climate. Yup - low sensitivity doesn't work with global, synchronous warming events that are supposed to have happened with only very modest changes in forcing. But that's denialism for you... a right pig's breakfast. Mike Jonas has a history of sloppiness. He likes to create FUD by jumping the gun and making false accusations against scientists. One is where he mixed up the Brown University climate scientist John Marston with the BU archaeologist John Marston. If it wasn’t for real auditors keeping the fake skeptics honest, readers would actually believe this stuff. The John Marston thing had some quirks to it and took quite some sorting out. There were two "BU"s (Boston University and Brown University), There was a John Marston at each, but then one moved to the other. Both were interested in climate science. Please read the thread that you have linked to, and note that I acknowledge the error as soon as it is pointed out. Just as I did here with the incorrect figure for FAR Fig 7.1(c). So - enjoy the diversion, but then do get back to the issues of substance. Jonas, Are you some sort of parody? No Webby, just the normal me, using my real name unlike some others here. I have yet to see you acknowledge your error about GCMs not being able to model Milankovitch cycles...and the general irrelevance of doing so over the (for us) relevant time periods of a few hundred years. Jonas, Not too hard to figure out who I am. Yet even that is probably too much for you, as you are able to character assassinate the wrong John Marston ! "The next, John Marston, appears not to be a “skeptic”. He is involved in making “recommendations about sustainable adaptation to climate change in the region [Turkey] over the next few hundred years”. http://bu.academia.edu/JohnMarston"
You portray that as a "character assassination". "Cripes, I just clicked on the link that Mike Jonas made to John Marston and it gave me a start. It points to some archaeology dweeb from Boston University, and not the physicist John Marston from Brown University." So now someone whose only offence was to be mis-identified becomes a "dweeb". WHT, you really are a rather nasty piece of work. Jonas, You are the one that is a nasty yet inconsequential piece of work.